Matt Taylor’s side enjoyed a storming start to the Sky Bet League Two season, winning six of their first nine games, but things have gone a little awry in the past month. The Grecians haven’t won in the league since seeing off Swindon Two 2-0 on October 13, claiming just two points out of the past 12 available to them. Like the Cobblers they were also knocked out of the FA Cup at the first round stage last Saturday, losing 3-2 at home to Blackpool, but they did claim their first win in six matches in all competitions on Tuesday when they saw off Bristol Rovers in the Checkatrade Trophy. That will have been a boost, but their league form will still be a concern for the Grecians supporters, and Curle feels the reason is, like the Cobblers, they have been hit by injuries to key players. 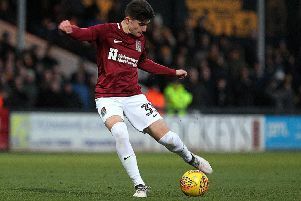 “I think Exeter had a very good start to the season, and in some respects they are similar to ourselves that they have now picked up a few injuries that has disrupted their natural team selection,” said the Cobblers boss. “They will probably be the same as us in that they will have a few players coming back in. Curle will obviously aiming to deny Exeter that kick-start this weekend as he targets a fourth straight league win for his team. “For us, it is back to league action and we need to maintain the momentum that we have gained,” said the Town boss. The Cobblers set off for Devon on Friday morning and were due to train in the south west later in the day. It is one of the longest treks of the season for the Town players and their supporters, but to Curle it is water off a duck’s back. “With my experience of being the manager at Carlisle, it is quite a short trip to Exeter from Northampton!,” joked the Cobblers boss, who admits he is desperate for his players to put on a show for the fans who do make the effort to get to the game. “Every club and team prepares slightly differently for these trips, and I am probably different to a lot of managers. “We will leave early, we will get down to Exeter and we have a training venue there that we will go to and train when we are there. “It is an opportunity to spend time with the players on the coach, but when we get down there the mind-set is we are there for a reason. “What I have picked up on so far here is that the away support that we get here at Northampton is fantastic.